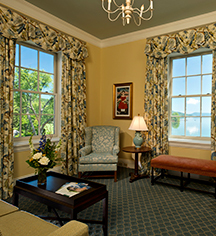 Guests of the Otesaga can choose from beautifully decorated, smoke-free guestrooms, including 25 suites. In-room amenities include cable television with HBO, telephones with voicemail, wireless high-speed Internet, irons and ironing boards, hair dryers, toiletries, and Turkish-cotton towels. Nightly turndown service, complimentary afternoon tea and cookies, as well as Concierge Service are available for our guests. The Cooper Inn is a short distance from the many attractions of Cooperstown including The National Baseball Hall of Fame, The Farmers’ Museum and Fenimore Art Museum, the shopping district of Cooperstown, Lake Otsego, and Glimmerglass Opera. For the business traveler, The Cooper Inn is convenient to all Cooperstown businesses, including Bassett Healthcare and the Otsego County offices. Small groups have use of meeting facilities at The Otesaga year round. 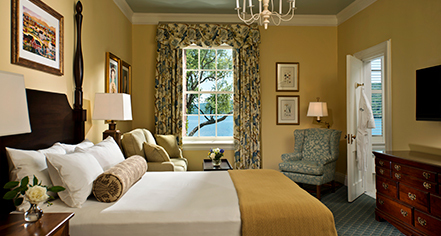 Fifteen classically-appointed, smoke-free guestrooms, each equipped with high-speed Internet access, cable television, air-conditioning and private baths. A complimentary Continental Breakfast is served each morning along with an Honor Bar each afternoon. In keeping with its name, central upstate New York’s Otesaga, which is derived from the Iroquois word for "A Place of Meetings," is an excellent place to gather. Meeting and conference planners will find the Otesaga ideal for groups as large as 350.